are we doing it as well as anyone else? There are some variations - like funky long benches with offset sections to try and bridge the requirement of small group versus individual work. What I havn't been able to search is what I call 'beanbag labs' ie semi formal study areas where students can bring their own laptops, plug into wifi, and work between tutorials. I suspect that these are provided as open bench areas or as clusters of traditional carrels in the main, but that institutions with newer funkier facilities provide a range of options from the traditional reading room bench to the more comfortable chairs and beanbags type area. all images are copyright their original owners unless otherwise stated. More on the e-book theme: Amazon have just announced a shorter document format called 'Kindle Singles'. In essence it's a digital pamphlet format, and basically, as a reflowable format it makes reading short form documents, currently almost universally distributed as pdf's easier on a kindle. It's been my experience that working with pdf's on an e-reader is a pain - pdf's are designed to display as per the printed page, which is not necessarily what you want on an e-reader - at its simplest you want the document as a single column, not a two column format. And while the linearity implicit in e-readers is an irritation, it's probably less with short form documents, where it's possible to hold the document in one's mind as a whole. TNW is probably correct when they suggest that the short form Kindle publication is a play for the college market - it would open up the e-reader for things such as electronic reading bricks, and if journal publishers were to adopt a reflowable format, make possible the easy reading of research papers on an e-reader. [Update: one of the other nice features about using TEI or some other super format for contents storage as opposed to content delivery is that it makes content delivery in alternative formats a simpler problem, allowing the simple on-demand production of books in alternate formats such as DAISY for use by the visually disabled. there may have been others, I simply don't know as part of my holiday regime is not to read blogs and tweets (and not to post either, the Thucydides post was written on the ferry somewhere between Venice and Patras in mid September). On our recent trip to the Pelopennese I was struck as to just how many oaks there were - big majestic ones lining the road over the mountains between Kalamata and Sparta, small scrubby sessile ones in the hills behind Kardymylli, and of course where you get oaks you get acorns, and acorns means pigs, and pig hunting was important to the ancient Greeks both culturally and as a source of protein. (It still in in the north of Greece, and is often the only meat other than the ubiquitous goat available at rural tavernas). Now a long time ago, long before I met J, I had a girlfriend who was doing a PhD in ethnobotany and was particularly interested in the use of nuts, including acorns, as a food resource by pre-agricultural populations in Europe, and hypothesised that these populations might have actively managed the forest to provide oak groves to aid the harvesting process, in much the same way as populations in PNG and some Australian aboriginal populations actively managed the bush to enhance the abundance of particular plants. 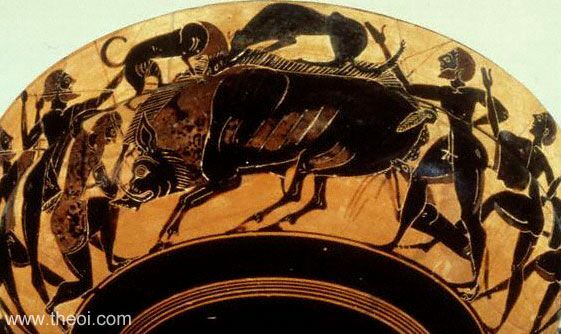 We know for sure that the Greeks ate acorns, there are literary references to the poor eating acorns, which would certainly provide an inducement for people to manage the forest for acorn production. And half way up a Greek hillside it occurred to me that if this was the case, they would also have attracted pigs, making them easier to capture and kill. Now acorns are not the most enjoyable things to eat - they take time to prepare and they're pretty boring - I know as one of Sarah's predilictions was to experiment with these forgotten foods, and all I'll say is that having eaten them, I'd say they're up there with ground elder as something best left forgotten. If you are curious there's a number of recipes on the web, or else you could try looking in a Korean supermarket for acorn noodles or acorn jelly - acorns were, and still are to a limited extent, also eaten in Japan and Korea. Pigs of course have a different opinion about acorns. They relish them. And pigs fed on acorns taste particularly good, as the packs of acorn fed jamon serrano in Spanish supermarkets attest. Just as I finally got the e-reader on our recent trip, I also finally really get push email. Basically it means that the email will get to your phone as long as its on a network somewhere, without the phone having to periodically poll the server which wastes connection time. And of course the service can be refined to strip out graphics and the like so all you get is text on your phone. And it meant that when someone did need to get in contact they could. Basically it gives email the utility and pervasiveness of text messaging, but infinitely more useful as it’s also in your inbox when you finally get online to manage your email. It was somewhere over the Arabian sea that I finally learned to love my e-reader. I’d started re-reading my battered Penguin classics translation of Thucydides History of the Peloponnesian War fully intending to take it with me on our trip to Europe. However, one look at my already bulging daysack convinced me otherwise, and did I really want to lug half a kilo of dead tree round Europe? So on a whim, I plugged an old spare 16MB SDcard into my laptop, downloaded Crawley’s masterful 19th century translation to it in epub format from Project Gutenberg, clicked it into my e-reader, checked it worked and stuffed my e-reader into my pack instead. Long haul flights are boring. You eat, watch a movie, try to sleep as much as possible but the sad truth about a fourteen hour flight is that you will get bored and run out of options to entertain yourself. So as the sun rose I turned to my e-reader and sat there enjoying the beauty of Crawley’s nineteenth century prose. I was hooked. And as long as there was some reasonable light I was hooked. In use the device was light and easy to use – so much so that in the course of the trip I’ve worn some of the paint off the ‘next page’ key. In Venice I downloaded some other texts to read via my travel computer and continued to read using the e-reader, even in bright sun in a Greek olive grove. And the battery life was fantastic – 8000 page turns is between 16 and 20 books worth of reading, more than enough for a month’s travel. I did take a conventional paper book with me, and I brought it back unread so converted to the e-reader was I. And the trick of using an old SD card freed me from the need to carry the download cable everywhere as both my travel computer and home laptop have SD-card slots. (Incidentally, in London Nintendo was advertising a cartridge of public domain classics to read on the train – trying to muscle into the e-reader market). as you may have guessed from the blizzard of tweets we're back from four or so weeks in Europe - various posts and pictures will appear over the next week or so. And yes - we had a great time !